Questionable dental hygiene practices need to be benched. When you wear braces, cleaning teeth and gums properly takes on extra importance. Brushing and flossing should be done a minimum of twice a day, but it is a good idea to clean teeth after meals to prevent build-up around the brackets. Brushing more frequently does not mean brushing more aggressively. In fact, being gentle is important, so wires and brackets are not damaged. Choose a soft-bristled brush, a fluoride toothpaste, and rinse. At Orthodontics by Birth, Stewart, & Fletcher, we recommend brushing after each meal to dislodge food particles. Floss gently by threading the floss between the wire and teeth, working it back and forth slowly. Before brushing it is wise to rinse the mouth with water to remove that first layer of debris left on teeth after meals. Make sure you have at least a soft-bristled brush and floss with you at all times. Angle the brush, so the bristles reach under the wire and clean as close to the brackets as possible. End the night with a fluoride rinse to strengthen enamel and help prevent decay. As much as you may miss your sweet treats, that radiant smile will be worth it on reveal day. Drs. Birth, Stewart, & Fletcher will provide a list of foods to avoid. If you are unsure about a food or treat, ask yourself if it is sticky, chewy, or hard? Sticky sweets tend to get stuck in brackets and under wires. Hard, crunchy food like pretzels, or even ice cubes, have the potential to break wires and dislodge or break brackets. It is wise to avoid chewing on the ends of pencils or pens. 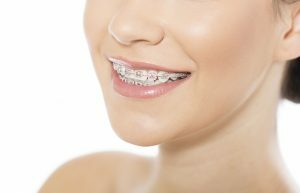 Even nail biters can cause inadvertent damage to braces. Create a mini dental hygiene kit to take on the go. Include a soft-bristled travel toothbrush and a mini tube of fluoride toothpaste. Make it a habit to visit the restroom after each snack and meal to do a quick rinse and brush. Spending a few minutes to remove food particles from teeth surfaces goes a long way in preventing staining and decay. Braces should not be a deterrent to participation in sports. A number of different mouth guards are available that protect braces, teeth, and the inside of the mouth from damage. The American Dental Association recommends the use of mouth guards on both top and bottom teeth. Besides regular visits to the orthodontist, you should still visit the regular dentist for cleaning and check-ups twice a year. The dentist can help identify areas you need to strengthen in your dental hygiene routine. For example, if plaque has begun to build-up between teeth, a lesson in proper flossing techniques is in order. Drs. Birth, Stewart, & Fletcher enjoy helping our patients maximize the benefits of braces with diligent dental hygiene.